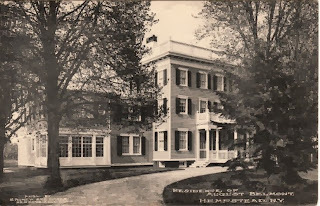 'Blemton Manor', the August Belmont II estate built c. 1865 in Hempstead. Click HERE for more on 'Blemton Manor' which has since been demolished. This appears to be an earlier photograph than the one Zach previously posted. In this picture there are only multi-pane windows in the ground floor room to the far left; in the first picture two sections of those windows have been replaced with big, single-pane windows (glass doors?) – at least that’s the order I would guess. For some reason this photo makes the house seem a lot more attractive then the previous photo's. So, we have what appears to have originally been an 1860's Italianate, with a late 19th century Colonial Revival makeover, the portico a direct reference to McKim Mead & White's Taylor house portico at Newport, one of the most copied features of the Colonial Revival. THEN, in this photo, originally linked by Ancient in the previous post, we have what appears to be a 1920s neo-Greek Revival (Greek Revival Revival?) makeover, which also to the casual observer, unaware of the earlier Colonial Revival appearance, would give the house a different history----making it appear an early vernacular Long Island Greek Revival to which first an Italianate third floor had been added, and then an Ionic Portico more Roman (or Jeffersonian) at yet a later date. Most interesting is the Grecian cupola, which doesn't appear in the earlier pictures. Clearly the next owner wanted something that suggested ownership by a properous whaling captain. All interesting. The last Mrs. August Belmont, the actress Eleanor Robson, later briefly summered at Belcourt in Newport, and finally landed up in this area, at Northeast Harbor, where she was a mainstay of summer society. In my long-ago youth, I remember being at the old Jordan Pond House at Seal Harbor. Seated at the next table was a trio, two of whose members seem to have been taken out of an Edwardian play, and freshly dusted and powdered. Discreet inquiry revealed that they were Mrs. August Belmont and Mrs. Ernest Flagg, widow of the architect, with Mrs. Flagg's daughter---indeed last vestiges of an earlier age, remarkable even 40 or more years ago. In the photo on your blog it looks very attractive and could almost be in Salem, Mass., or Portmouth,NH. I used the link provided by Down East Diletante and could almost understand why it might have been torn down. To my eye it does not appear to have coherence, but then I can never guess what people like. 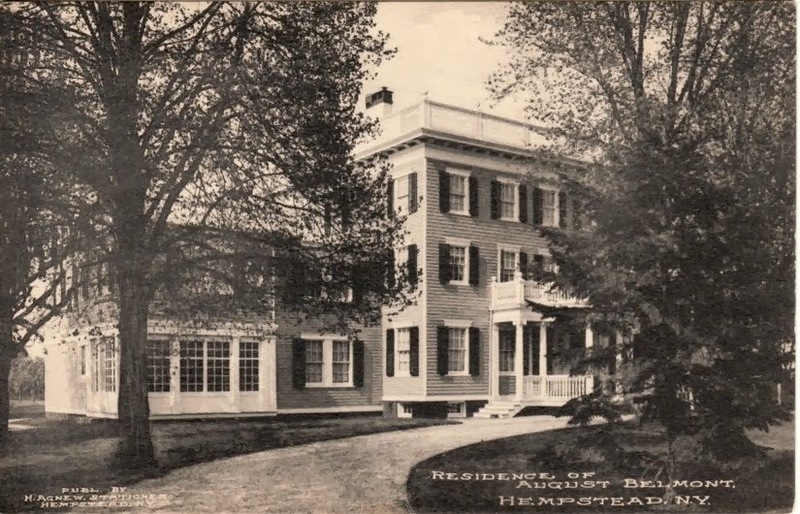 Supposedly at one time, Hempstead was the hub of the social derby for Gilded Age social climbers; but there is so little information on the families and estates that once resided there, it makes you think it must have been one of the first casualties of progress that destroyed many estates and resort areas around the country.